The sun is out, the mercury is rising, and the cry has gone up: where can we have dinner outside? Whether you want to grab an al fresco lunch, a long dinner with friends or dance the night away under the stars, there are dozens of great venues spread out across the city. We’ve pulled together a few of our favorites, organized by popular areas. We’ve also added a handy price guide. If you’re looking for somewhere to enjoy football, German food, and beer all at the same time, look no further than Hacker-Pschorr Bräuhaus. With over 100 outdoor seats, the Bavarian-style beer garden is always packed in the summer, especially during big football fixtures. 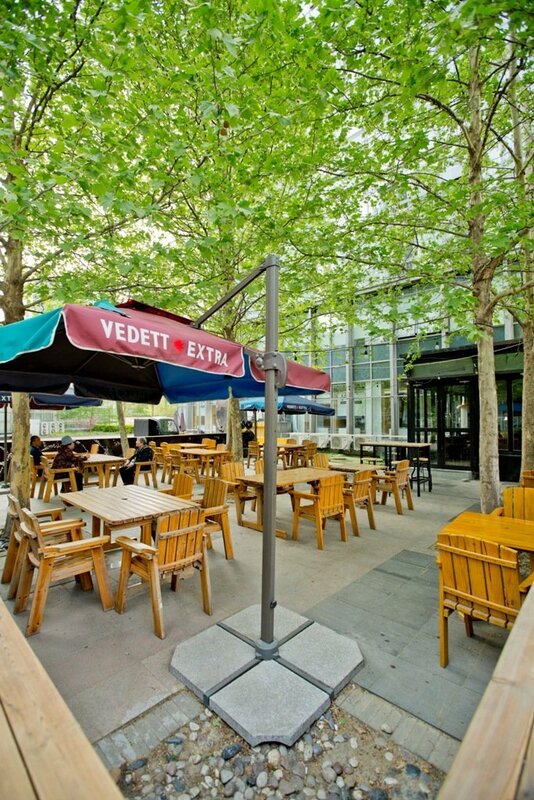 Home Plate’s Sanlitun location has an outdoor patio for about 24 people which they open up once the sun is shining and the weather is warm. Pro tip: you can book the whole terrace out for parties (if you’re popular enough). Already one of the most talked about openings of the year, the completion of Hulu’s terrace has only made it hotter. The terrace is expansive and tastefully furnished in white, the perfect place to sip a bottle from their well-priced wine list. The group behind Shanghai’s Bar Rouge have bought their impressive pedigree to Beijing, opening the swanky restaurant/lounge InfraRouge in Taikoo Li North. Split over two floors, the upper floor has a nice terrace with views over Sanlitun and plays hosts to regular DJ nights. Sitting on the west side of Gongti, Legend Beer is a hulking 400sqm venue with a patio just begging to be filled through Beijing’s elongated summer months. To tempt patrons in, the terrace – filled with large picnic-style wooden tables – comes equipped with massive screens for sporting events as well as a special spit, big enough to roast an entire cow! 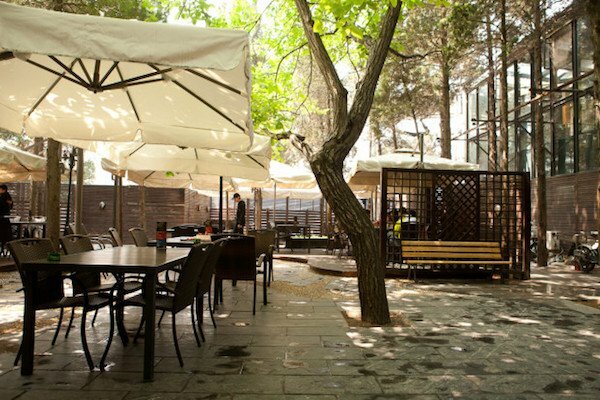 The courtyard of Nali Patio might not be the first place that comes to mind when you think “Sanlitun” and “al fresco,” but the shaded space at the back makes for great outdoor dining. Moka Bros is our pick of the bunch because there’s both healthy to be found if you’re trying to absolve your weekend sins or strong drinks if you want to prolong your debauchery. Mosto’s outside tables are perfect for a lazy dinner that lingers long into their after-dinner happy hour (cocktails and house wine are RMB 40 between 9-11pm). Book ahead to guarantee a spot. Just south of Gongti west gate, French-styled wine bar and restaurant Paradox has a roomy terrace that offers a nightly outside kitchen. The terrace outside Q Mex may be small but it provides a welcome respite from the crowds inside. The classic margaritas are delicious but strong – you have been warned. It’s not an eloquent patio with a captivating view or a mind-blowing design, but that’s the appeal of Taco Bar’s no-frills, front porch vibe. Its outdoor seating is prime for people watching over brunch or evening tacos and cocktails. The Roof bags the Topwin Center’s most coveted spot as well as the complex’s least original name, a fitting motif as you overlook the south side of Sanlitun among the area’s young elite. A fine spot for a cocktail, a serene evening with a hookah, or even a bowlful of oysters. You get the idea. If you want to fill up on pizza, there are few better options than Tube Station’s huge pies. 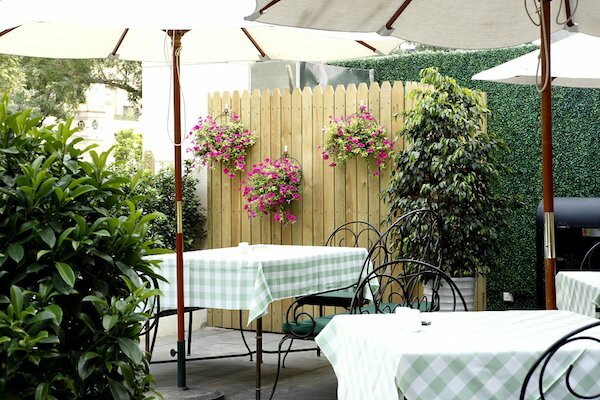 The Gongti location has a small, shady terrace, perfect for fuelling up before a night at the clubs in the area. Most of Swire’s venues in Beijing have excellent outdoor seating but with its bamboo screens and wooden bench seating, Opposite House’s Village Cafe is our favorite. A good place to have lunch, worth through the afternoon on your laptop or grab a quick drink after work. Blue Frog has managed to bag one of the best seats in the house on the sixth floor of Guomao’s new, glitzy China World Mall. 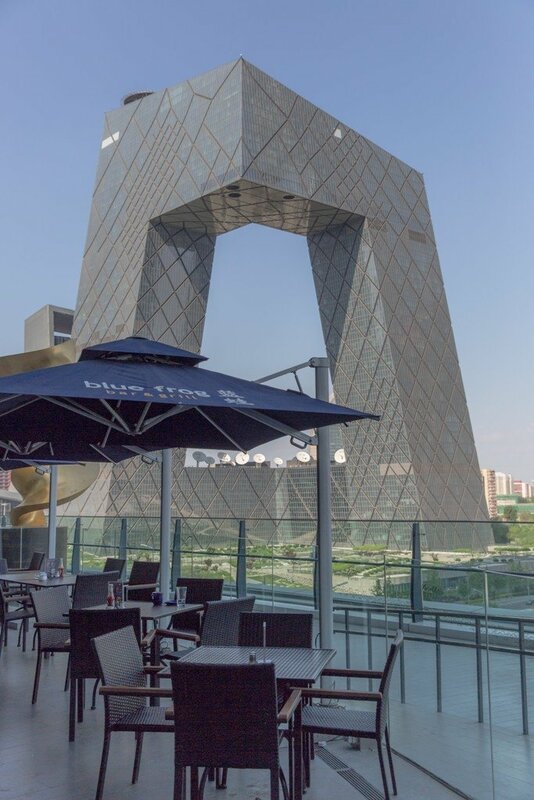 The spacious terrace and superlative views of the CCTV Headquarters and surrounding CBD have diners lingering outside well past dusk. Caravan brings life to the otherwise-quiet western end of Guanghua Lu. An all-day happy hour, daily food and drink promos, and tasty Moroccan and Cajun food make Caravan’s terrace a great place to hang out any time of the week. One of Beijing’s longest-running hotel bars has a few nice tables outside, the perfect place to enjoy their great value daily happy hour (buy-one-get-one-free drinks, 5-8pm). It’s quieter than inside once the band gets going, too. Perhaps not surprisingly from the people who brought us Sanlitun’s most Instagrammed terrace (RIP), we’re loving everything about the terrace at Migas Mercado (pictured at top), from the striking yellow and purple color scheme to the panoramic CBD views. Set right in the middle of Central Park and the Office Park, Pak Pak’s terrace is perfect for business lunches or the after-work drinks crowd. The Thai dishes are spicy and authentic, and the Thai-inspired cocktails are not to be missed, either. Arrow Factory’s Liangma River-facing deck consists of a fully-stocked bar, wooden benches, and a panoramic view of the embassy area. The menu is also worth salivating over, with its upgraded take on British pub food; think ale pies, sausages, a pita stuffed with pulled pork, salads, and a bunch of snacks for sharing. Deep in the embassy district, down an alleyway opposite the US embassy lies one of Beijing’s best terraces. Casual French restaurant Bistro 108 and its neighboring restaurants (including Italian trattoria La Villa) share a long terrace that we feel is going to become one of the city’s biggest hotspots this summer. Bottega Nali Patio has a few tables outside but it is the Xinyuanli location that takes the prize for best outside seating. Last year they ran frequent barbecue and drinks parties on the terrace, which we expect them to bring back this year. Great Leap’s Xinyuanli location has a shady terrace, the perfect place to enjoy a few brews and a pizza on a hot summer day. The weekend fried chicken brunch is not to be missed, either. 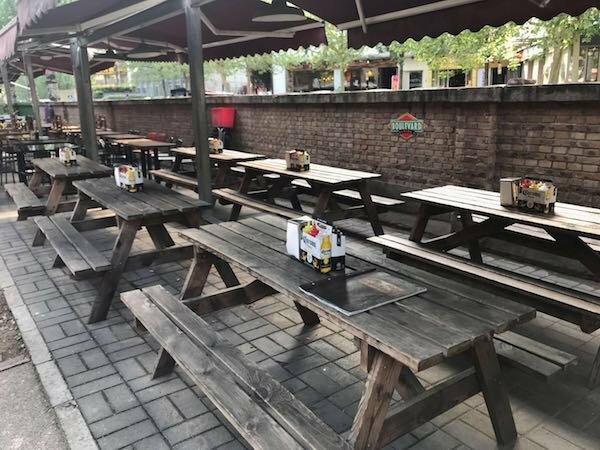 Home Plate’s Sanyuanqiao location may be smaller on the inside but its outdoor seating beats the Sanlitun location with picnic tables being able to sit 30 people easily. Don’t miss the liberally-poured Long Island iced teas. On the lobby level of the elegant Bulgari hotel, the interior of Il Bar is attractive enough but it is the recently-opened terrace on the banks of the Liangma River that will be drawing the biggest crowds this summer. Look for a pop-up gin bar to open on the terrace soon. Gourmet pizzas and a quiet spot facing the Liangma River make Lievito a great spot for al fresco Italian. Downstairs, Fiume (from the same owners) also has a few shady tables by the riverside. 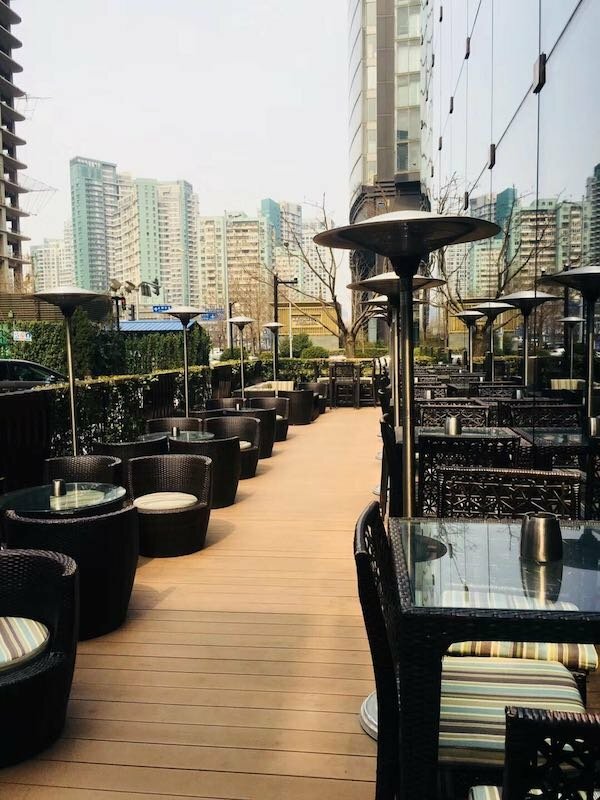 If you’re looking for somewhere to spend lunch outside in the Liangmaqiao area, look no further than the small sunken terrace at Obentos. Their healthy take on Japanese cuisine will leave you with loads of energy for the afternoon. The menu at Palms LA is a Korean-meets-Mexican culinary mash-up. 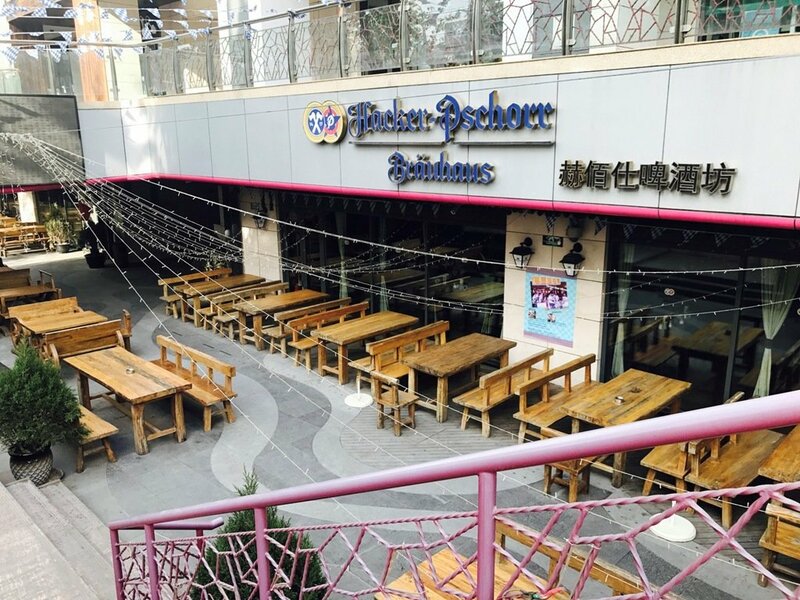 Located between Liangmaqiao and Sanyuanqiao, the restaurant has a great patio for outdoor dining and boozing, especially for bigger groups. 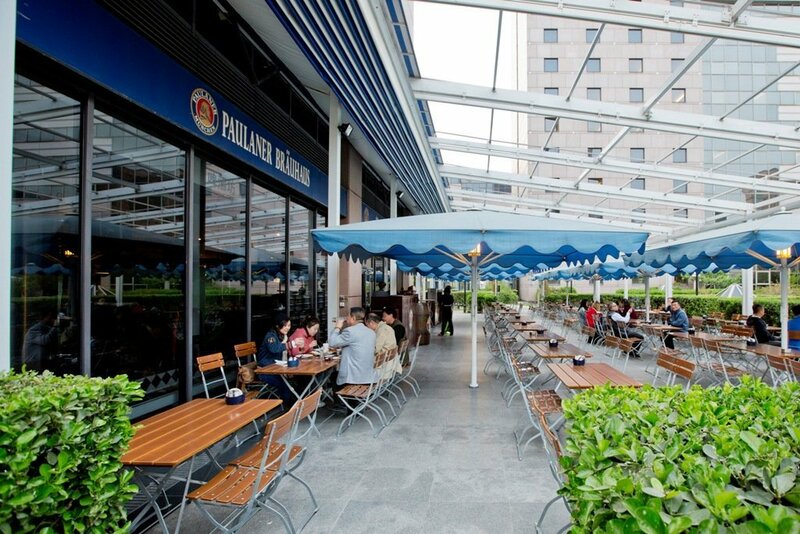 Paulaner’s abundantly lush greenery and the friendly staff, dressed in traditional Bavarian uniforms, help patrons feel like they’ve been transported to a warm and inviting German hamlet. The brewed-on-site pints and beer garden make it appealing for lazy summer day drinking. Shanghai’s greenest import, Element Fresh, brings healthy American food to Beijing at its many locations. Our favorite branch for this season’s lounging is in Lido, on the second floor. Their menu boasts salads, pasta, wraps, and a smattering of Asian standards. 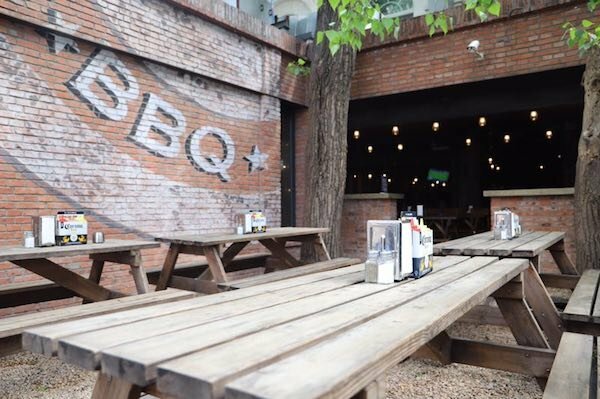 Several terraces and a shady beer garden, where they host occasional barbecue parties, make Eudora Station an excellent choice in the area. Serviceable American food and a wide selection of beers and cocktails. 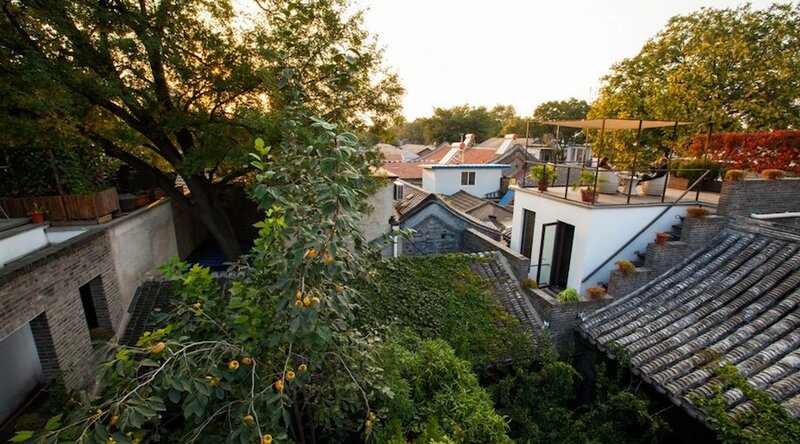 Maison Flo may seem a bit out of the way perched at the northeast end of Xiaoyun Lu, but their choice of location becomes clear when you see the extensive outside terrace and garden. A popular venue for spring/summer weddings. 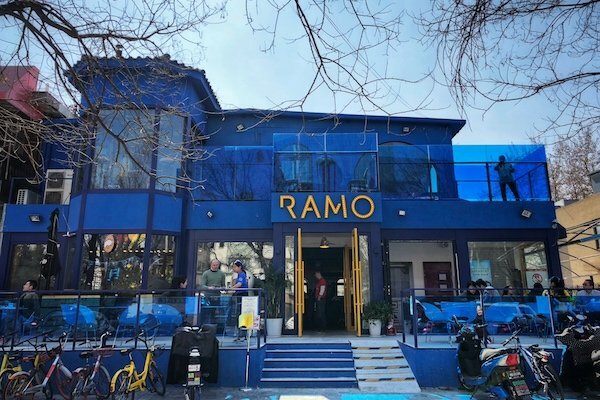 Ramo certainly got an upgrade when it moved from Fangjia Hutong to Lido, with a new two-story, 500sqm space, with terraces on both floors. The first floor is more for dining, while the second focuses on events and cocktails. The bar at EAST Hotel offers something for pretty much everyone, with great cocktails, a live band, wood-fired pizzas, an oyster bar, and a craft beer bar. The sunken booths on the terrace are great for groups. Upstairs, all-day dining restaurant Feast also has a terrace. Dali Courtyard offers diners the chance to explore flavors most often commonly found in Yunnan from a rotating seven-course set menu. The restaurant is located in a beautifully renovated hutong courtyard, equally suitable for a romantic date or the perfect spot to impress visitors. 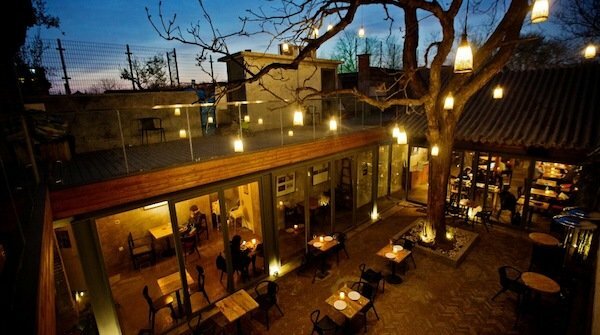 Young and funky Italian owned restaurant Eatalia boasts a nice terrace at their Di’anmen location. The menu has recently had a revamp. 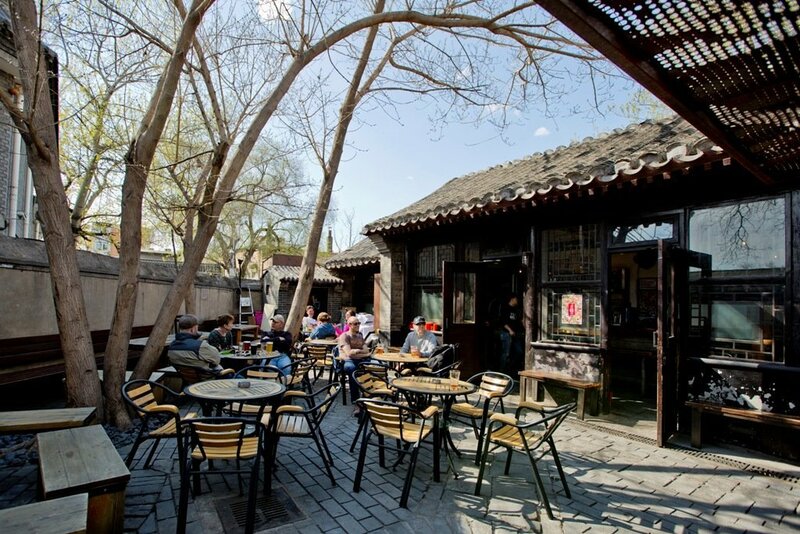 GLB’s original Doujiao Hutong venue remains a favorite, not only for its brews but also its charming Beijing hutong vibes. The only downside is that it doesn’t have a food menu, but that doesn’t stop you from ordering chuan’r from one of the many restaurants nearby who deliver (ask the bar for menus). Le Little Saigon can be easy to overlook, tucked away just west of the Drum Tower and surrounding hutongs. Perched high up amidst the trees and vines, this Vietnamese-French bistro serves a unique range of dishes from pho to beef bourguignon, guaranteeing to satisfy all tastes, and solidifying its place as a favorite among tourists and locals alike. From the owner of Mai Bar comes Mai Fresh, a breezy all-day dining restaurant on Beiluogu Xiang. A sunny courtyard and a terrace make this hutong spot a great place to enjoy a healthy brunch overlooking the surrounding slate rooftops. Susu is like the courtyard home we wish we had. The trek down Qianliang Hutong to find it only makes the excellent Vietnamese cuisine that much better. 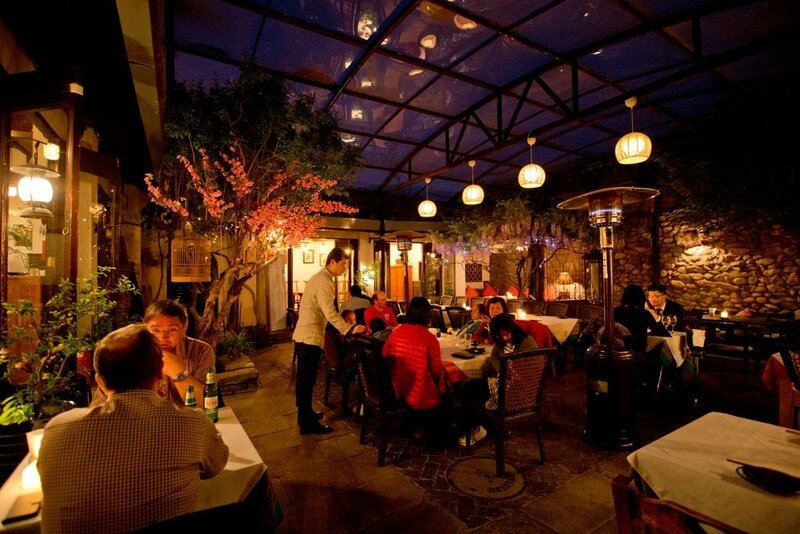 The terrace at Toast, at The Orchid hotel, features pleasant views over the nearby hutong roofs. The menu is loosely Middle Eastern-inspired, using local Beijing ingredients where possible. The kitchen is open for breakfast, lunch, and dinner. 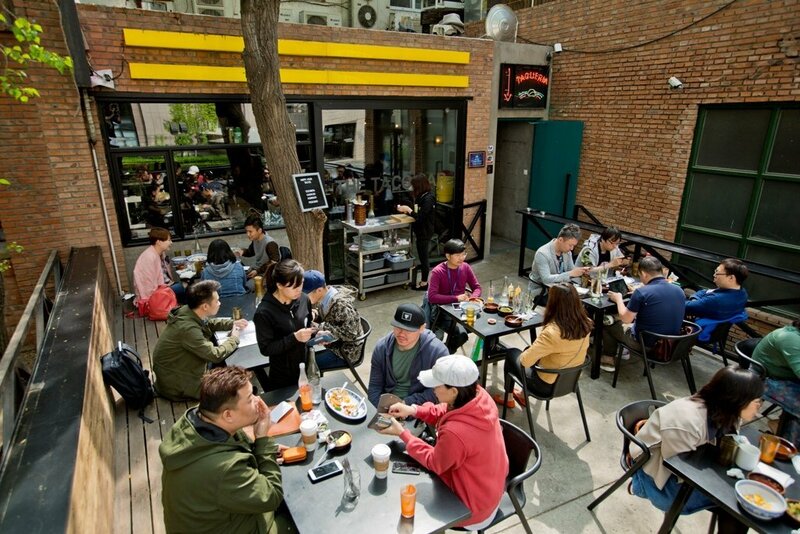 A favorite of Beijing’s freelance crowd, a table in the sunny courtyard is a coveted spot. Zarah offers healthy breakfasts, great coffee, and – once the sun goes down – a good value range of drinks and wines by the glass. Neighborhood sports bar with sunny outside seating in the Pingod community in Shuangjing. They do a mean line of burgers too, which are 50 percent off with the purchase of a beverage on Mondays. The Solana branch of Moka Bro’s has a sun-drenched south facing terrace that makes a great spot for weekend brunch/lunch, especially for families. 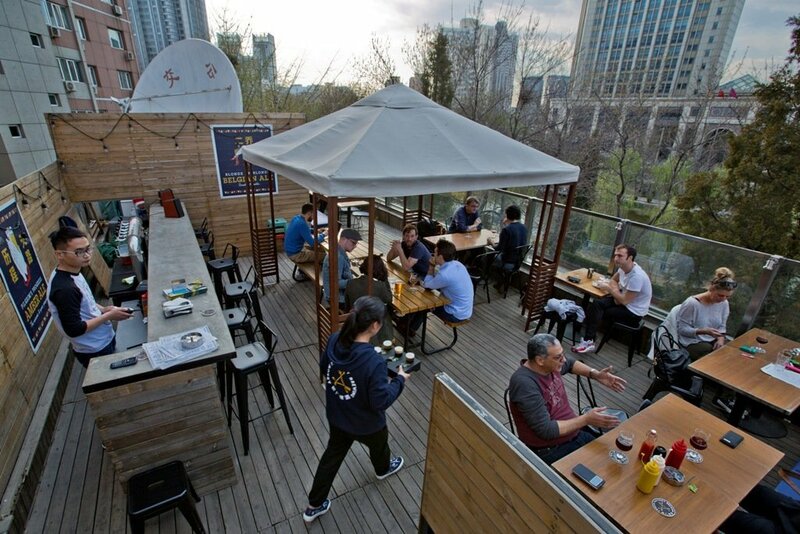 Shuangjing’s, and perhaps Beijing’s, preeminent vegan restaurant Root Pop sports a small outdoor area for diners to enjoy their diet-conscious American-leaning grub like salads, nachos, burgers, and hot dogs. Set in a quiet residential compound on the south side of Chaoyang Park, The Rug’s Lishui Jiayuan location has earned its reputation as one of the city’s hottest spots for brunch over the years. Busy on weekends. One of the most exciting recent openings in the new WF Central mall, The Rug Cafe is beautiful inside and out, so there’s no need to worry if the rains set in. Expect Instagrammable dishes and creative drinks.